For years, everyone had assumed that five fingers and toes was the normal complement for tetrapods. The so-called pen-tadactyl ('five-digit') limb was a classic synapomorphy of all tetrapods, from salamanders to humans. Our counting system is based on ten, in other words, two handfuls of fingers. The new finds of basal tetrapods with six, seven, or eight digits showed that there is nothing special about five digits, and that each finger or toe is not individually mapped to a single gene. The tetrapod limb can be divided into three portions that appear in the embryo one after the other, and that appeared in evolutionary history in the same sequence. First came the proximal portion of the limb, the stylopod (the upper arm or thigh), equivalent to the root of the fins of Silurian fishes. The middle portion of the limb, the zeugopod (the forearm or calf), appears in sarcopterygians in the Devonian, and the distal portion, the autopod (the hand and wrist or foot and ankle), appears only in tetrapods in the Late Devonian. This evolutionary sequence is replicated during development of the embryo (Shubin et al., 1997; Coates et al., 2002; Cohn etal., 2002). At an early phase, the limb is represented simply by a limb bud, a small lateral outgrowth from the body wall. Limb growth is controlled by the Hox genes; all animals have Hox genes, and these function in determining position and orientation of the early embryo, segmentation, and other aspects of the architecture of the body. Early in fish evolution, five of the 13 Hox genes, numbered 9-13, were co-opted to control limb bud development. Manipulation of embryos during three phases of development has shown how this works. In phase I, the stylopod in the limb bud sprouts, and this is associated with expression of the genes HoxD-9 and HoxD-10. In phase II, the zeugopod sprouts at the end of the limb bud, and the tissues are mapped into five zones from back to front by different nested clusters of all the limb bud genes HoxD-9 to HoxD-13. Finally, in phase III, the distal tip of the lengthening limb bud is divided into three antero-posterior zones, each associated with a different combination of genes HoxD-10 to HoxD-13. Phases I and II have been observed in teleost fish development, but phase III appears to be unique to tetrapods. In the development of vertebrate embryos, there is no fixed plan of every detail of the limb. A developmental axis runs from the side of the body through the limb, and cartilages condense from soft tissues in sequence from the body outwards to the tips of the fingers. In an osteolepiform (see illustration (a)), the developmental axis presumably ran through the main bony elements, and additional bones, radials, developed in front of the axis (preaxial side). 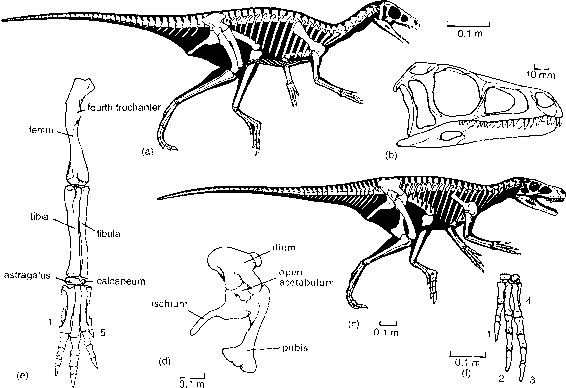 In tetrapods (see illustration (b)), the axis in the leg (arm) runs through the femur (humerus), fibula (ulna), the ankle (wrist), and it swings through the distal carpals (tarsals). 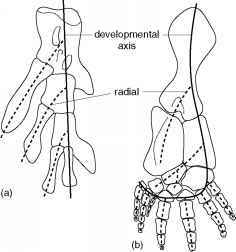 Radials condense preaxially at first, as in the sarcopterygian, forming the tibia (radius) and various ankle (wrist) bones. The developmental process then switches sides to sprout digits postaxially (behind the axis). This reversal of limb bud growth direction in the hand/foot is matched by a reversal of the expression of the Hox genes. In the zeugopod, HoxD-9 is expressed in all five zones, HoxD-10 in the posterior four zones, down to HoxD-13 only in the posterior of the five. In the autopod, on the other hand, HoxD-13 is present in all zones, but HoxD-10 to HoxD-12 are found only in the posterior zone. In the Late Devonian tetrapods, six, seven, or eight digits were freely produced, and it was only at the beginning of the Carboniferous that tetrapods seem to have fixed on five digits fore and aft. Since then, digital reduction has commonly occurred, down to four (frogs), three (many dinosaurs), two (cows and sheep), or one (horses) fingers and toes. In rare cases where there is a sixth digit (some large dogs, pandas) it is an outgrowth of the wrist or ankle bones. Read more at http://www.press.uchicago.edu/books/gee/shubin2.html (the antero-posterior zonation of the limb bud and Hox gene mapping). How many toes on frog?